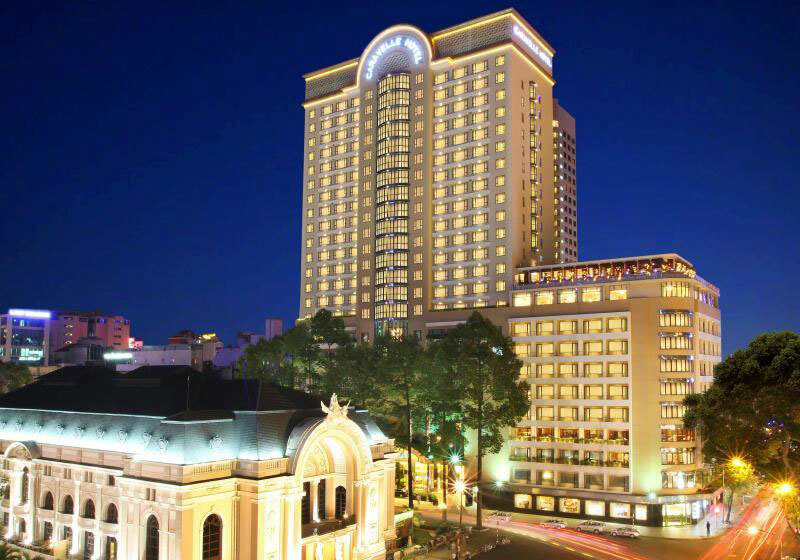 Caravelle Saigon Hotel is one of Ho Chi Minh City’s leading international 5-star hotels strategically located in the center of the business, shopping, and entertainment district. Guests will enjoy convenience with the location only eight kilometers from Tan Son Nhat International Airport. Caravelle Saigon Hotel’s modern design combination of French and Vietnamese architecture promotes an ambience of relaxed conviviality despite it being over 53 years old. A wide range of 335 appointed non-smoking rooms are offered with Wi-Fi Internet access throughout the hotel. Amenities include six superb wining and dining venues and the well-known rooftop Saigon Saigon Bar with a bird’s-eye balcony view of the neighborhood and live music. Short Description: Caravelle Saigon Hotel is one of Ho Chi Minh City’s leading international 5-star hotels strategically located in the center of the business, shopping, and entertainment district. Guests will enjoy convenience with the location only eight kilometers from Tan Son Nhat International Airport.